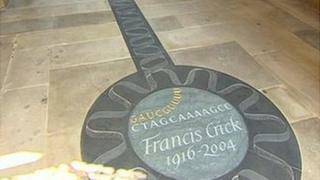 A memorial to DNA pioneer Francis Crick has been unveiled at his former college at the University of Cambridge. Attending the ceremony at Gonville and Caius was Dr James Watson, who shared the 1962 Nobel Prize with Crick and Maurice Wilkins for revealing the structure of DNA. The engraved stonework depicts the DNA double-helix and marked 60 years since their discovery was published. The breakthrough was hailed as one of the greatest in scientific history. Crick's and Watson's groundbreaking work was published in the journal Nature on 25 April 1953. Before the structure of DNA was unscrambled no-one had a clear idea how genetic replication - one of the cornerstones of life - worked. At the unveiling, in front of friends, colleagues and family, Dr Watson paid glowing tribute to his colleague, who died in 2004. The 85-year-old American, who went on to direct the US arm of the Human Genome Project from 1988 to 1992, said: "Francis was the brightest person I ever interacted with. Image caption James Watson (left) said Francis Crick (right) was "like my older brother"
"I met the great physicist [Richard] Feynman but I didn't understand what he was doing, so it didn't mean anything. Francis I could talk to. "It was one of the most important papers ever published and we sort of knew that when it came out. "I haven't lived the last 60 years thinking I'm a celebrity or my name would be put on the same par with [Charles] Darwin, but if I think about it I have to say, 'Yes, we did something big'." Sir Alan Fersht, master of Caius College, said: "It's roughly equivalent to the theory of relativity, discovering the laws of gravity and it's the keystone of modern biology. "They realised they'd done something enormous, but I'm not sure if they realised how important it has been in practical terms." The men's work earned them the Nobel Prize for Medicine in 1962, which they shared with Maurice Wilkins from King's College London. Rosalind Franklin also played a key role in the discovery of DNA but died in 1958, before the prize was awarded. DNA: the 'smartest' molecule in existence?